Contemporary Transport are specialist transport consultants drawn from a breadth of different disciplines. They provide a broad range of contemporary consultancy services helping clients to design and implement sustainable transport. 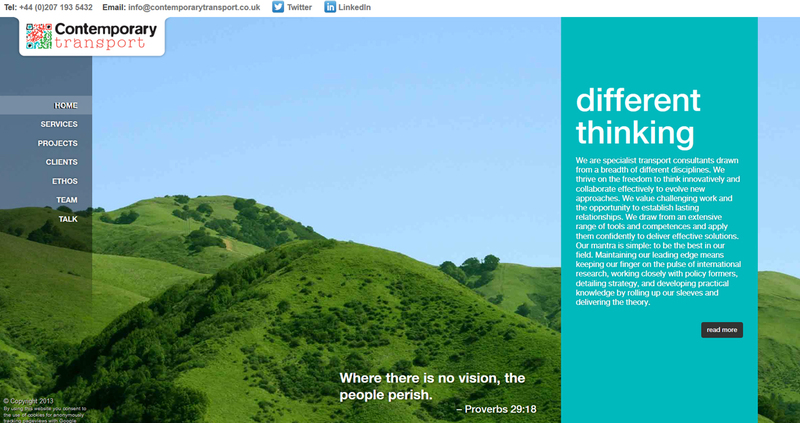 Having already designed an innovative Logo for them, Contemporary Transport required us to create a website to match. The website needed to be engaging, design led whilst being informative and innovative in its functionality. It had to satisfy enquiries from expert organisations looking to employ the services of our client. Many websites in this field employ very boring designs for their website. Both we and the client wanted to challenge the notion that a functional website was a boring one, even in a business to business environment. We focused on the aspirational elements of contemporary transport to evoke the feelings identified with the company rather than focusing solely on the (rather clichéd) cars and buses that other websites in the same sector used. The whole site aims to engage users on an emotional level as well as an intellectual one. ‘Contemporary Transport has built a reputation for providing innovative transport solutions around the world to unlock development land, and fid new approaches to addressing policy issues. We needed a website that would reflect this in its design and functionality, to give clients reassurance that they could call on us to provide new ideas. Addison Design created our Logo and Corporate branding so it was a natural progression to commission them to design and build a bespoke website. Working closely to our brief and our industry specific requirements, we engaged with them on a regular basis in order to produce the site we now have. Addison Design were receptive to our ideas, combining our aspirations with their expertise and professional intuition throughout. We loved working with them, they have a real can-do customer-first attitude to design which is exactly what we needed.